"Large shrimp tend to get rubbery when cooked. Grilling them is an excellent alternative. The bacon keeps them from drying out." Wrap shrimp in bacon, and secure with toothpicks. Lightly oil grate, and arrange shrimp on grill. Cook for 3 to 4 minutes, turning once. The shrimp will be done when the bacon is fully cooked. See how to turn three simple ingredients into a tantalizing party appetizer. My dad showed me how to make this recipe. It is really good you should try dipping the shrimp in melted butter mixed with garlic powder before wrapping in bacon. Try cooking the bacon a little before wrapping around the shrimp. This way you can be sure the bacon is fully cooked when the shrimp are done. I thought that the bacon overpowered the shrimp. we used larger shrimp, and the bacon was not done when the shrimp were. 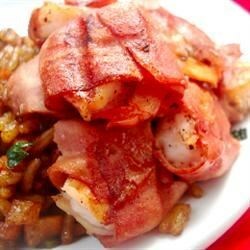 Great idea, but the bacon needs to be slow cooked until edible (but flexible) before wrapping the shrimp or else the shrimp will overcook.